Vienna is Austria's imperial city - a city still infused by memories of the past glories and yet revelling in what those influences have created in this modern metropolis. For the capital of an "alpine" country, Vienna is not a typical big city at all. It's big for a start - by Austrian standards at least - and it is one of the few of Austria's cities not to have any mountains in the background. Vienna, with over two million inhabitants in the city area and the surrounding suburbs, boasts a quarter of the population of the whole country. And, while much of Austria takes pride in what it means to be essentially Austrian (no, those dirndl dresses, leather shorts and folk music aren't just for tourists), Vienna has become a multi-cultural - almost trendy - melting pot of influences from across the old Empire and the new European Union. Vienna is, as the cliché goes, a city of contrasts. A city which can be conservative and status-obsessed - and yet one that can host the largest AIDS festival in Europe (and show it live on TV). A city which can celebrate the imperial glories of the past - and yet one where the left-leaning city government has made public services and social integration a cornerstone of its mandate. And really, that's what this site is about. Discovering Vienna without the gloss of the tourist brochures, or the spin of the travel companies. The Seeing section is designed to cover some of the main highlights, and a few of the less famous places to visit. A guide to the section can be found on the Vienna Sights page. The Doing section centres on activities that you can take part in - from the local sports events to seasonal festivals to the outdoors. 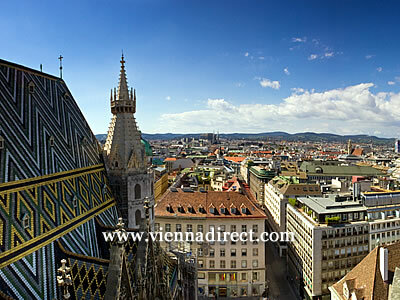 An overview can be found on the What To Do In Vienna page. The Sleeping section is, as its name suggests, devoted to where to stay - find more details about hotels, apartments and hostels on the Vienna Accommodation page. The Eating section covers the culinary side of Vienna, with a look at some of the dishes and customs of the city on the Food & Drink in Vienna page. The Moving section deals with getting to Vienna and getting around once you are in the city. More about the airport and ground transport can be found on the Vienna Travel Information page. Finally, we hope you enjoy the site. If you have visited Vienna and have any comments about the site, or any ideas or travel reports that you would like to share, please feel free to let us know using our Contact page. Summer in the city - what's going on?